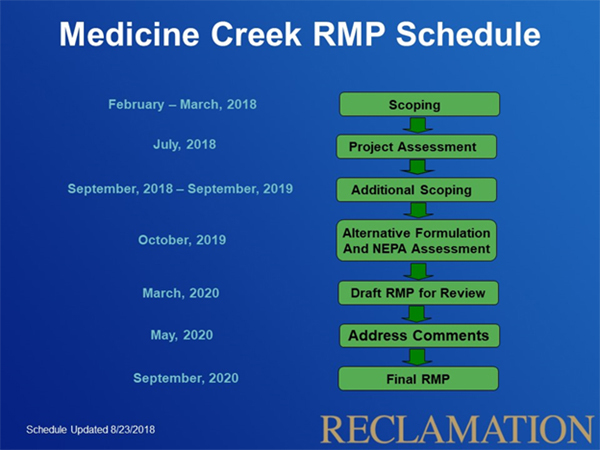 The Bureau of Reclamation, in cooperation with the Nebraska Game and Parks Commission (NGPC) is updating a Resource Management Plan (RMP) for the Medicine Creek Reservoir. 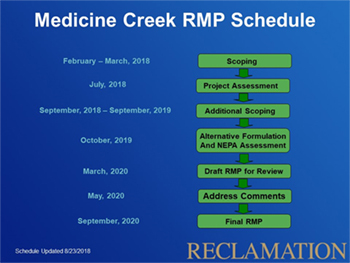 We are interested in your opinions and preferences regarding Medicine Creek Reservoir. This survey is voluntary and we will only report summaries of our findings. Your input is important, even if this is the first time you have visited the reservoir. Please take a few minutes to answer this short survey. When finished, please drop your completed survey in one of the drop boxes located at the campgrounds around the reservoir or at the Medicine Creek State Recreation Headquarters. Thank you for your help! The Nebraska-Kansas Area Office (NKAO) in McCook, Nebraska is part of the Great Plains Region and has a field office in Grand Island, Nebraska. NKAO manages Reclamation projects in Nebraska, Kansas, and Colorado. The management area for NKAO includes: all of Nebraska, except the North Platte Project Area (which extends from Wyoming into Nebraska); the northern portion of Kansas within the drainage basin of the Missouri River; and a portion of northeast Colorado that encompasses Bonny Reservoir. NKAO projects provide water for approximately 264,000 acres of farmland as well as flood control; municipal and industrial water; recreation, and fish and wildlife benefits. The reservoirs provide approximately 56,000 acres of water surface at normal pool and 75,000 acres of adjacent land for public use. The reservoir areas are managed by a number of Federal, State, and Local entities for fish and wildlife, and recreational purposes. The Bureau of Reclamation has an active program in the state of Nebraska. Facilities in the state provide water to over 250,000 acres of farmland which provide about $170 million worth of crops each year. Reclamation's work in Nebraska began soon after the agency was created in 1902. Studies were started in 1903 and construction began in 1905 on the North Platte Project which includes facilities in both Nebraska and Wyoming. The North Platte Project is managed by the Wyoming Area Office in Mills, Wyoming, with 75 percent of irrigation water supply delivered to the panhandle of Nebraska per Supreme Court Decree. Following construction of the North Platte Project, the Mirage Flats Project in the northwest corner of the state was built in the 1940's. Work followed on five divisions of the Pick-Sloan Missouri Basin Program authorized by the Flood Control Act of 1944. These facilities were built over a 40-year period. The first was the Frenchman-Cambridge Division P-SMBP in the southwestern part of the state which includes four storage dams along Frenchman Creek and the Republican River. Next came the Bostwick Division P-SMBP just downstream. Work on the Middle Loup Division P-SMBP in the north central part of the state commenced in 1955 and continued into the 1960's. Title to facilities of the Middle Loup Division was transferred to the Middle Loup Reclamation District November 22, 2002 by the Bureau of Reclamation. The transfer was authorized by Public Law 106-366, enacted on October 27, 2000. The Sandhills Division P-SMBP is near the confluence of the Snake and Niobrara rivers. The last Reclamation project built in Nebraska was the North Loup Division along the Loup and North Loup rivers. 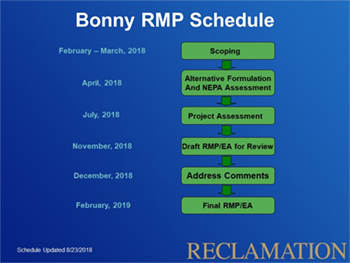 With the exception of the North Platte Project, the Reclamation projects in Nebraska are managed by the Nebraska-Kansas Area Office. Located in the country's heartland, Kansas was settled during the late 1880's primarily by farmers. Today, about 95 percent of the state is devoted to agricultural production. Dryland farming was marginally successful, but farmers were soon digging wells and banding together to sink deep wells for irrigation. The Bureau of Reclamation's first involvement in Kansas came in the mid-1940's as projects were started to provide storage for irrigation and to protect the land from devastating floods. Most of the development in Kansas has been done under the authority of the Pick-Sloan Missouri Basin Program (P-SMBP) created by the Flood Control Act of 1944 (P.L. 534). The projects in Kansas are in the Republican, Solomon and Smoky Hill River basins. All of these rivers drain into the Kansas River, a tributary of the Missouri. All but one of the Reclamation projects in Kansas are managed by Nebraska-Kansas Area Office in McCook, Nebraska. The Cedar Bluff Unit P-SMBP south and west of Hays was the first project built in the state. It was followed by the Kirwin Unit P-SMBP on the North Fork of the Solomon River, the Webster Unit on the South Fork, the Kansas Bostwick Unit P-SMBP in the north central part of the state, the Almena Unit P-SMBP near the town of Norton and the Glen Elder Unit on the Solomon River at the point where the north and south forks join. All of these projects were built for irrigation and flood control with all providing recreation and fish and wildlife benefits as well. 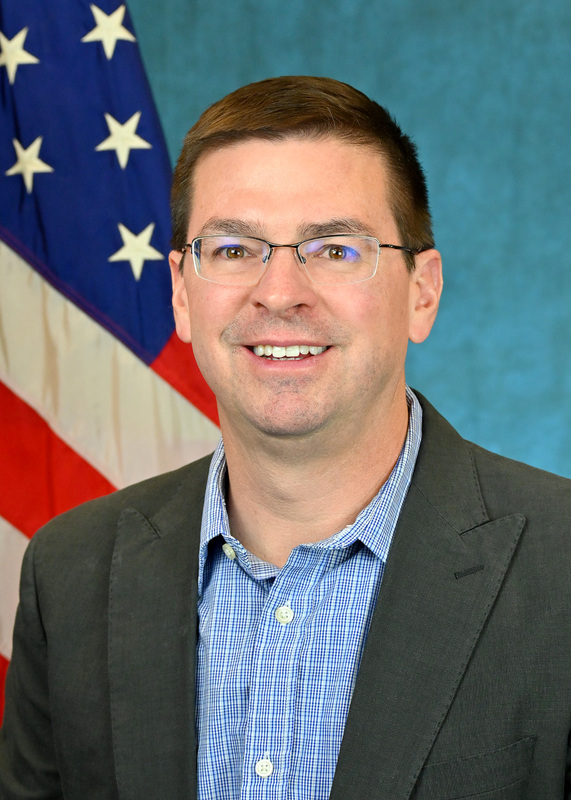 A seventh project in Kansas was not developed under Pick-Sloan. The Wichita Project (P.L. 86-787) is a multiple-purpose water project operated and maintained by the city of Wichita and the Kansas Department of Wildlife and Parks. Oversight for the project, which provides water for 350,000 people, is provided by Reclamation's Oklahoma-Texas Area Office.